The slot flex can be used on a hexaflexagon to get an interesting variety of shapes. Pictures and a description of this flex can be found here. Even on a seemingly simple hexaflexagon, this flex opens up quite a few new shapes and states to explore. While you can do a slot flex with as few as 4 sides, it starts to get interesting with 5 sides. 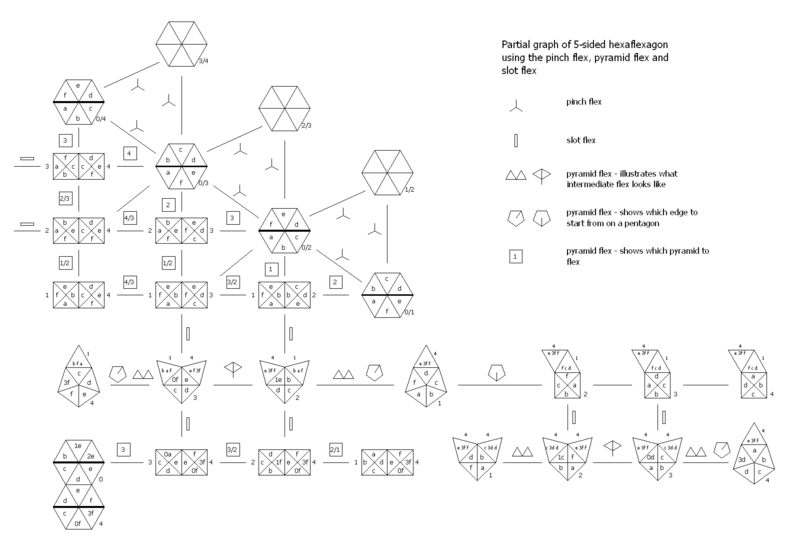 Below is a portion of the overall state diagram for the slot flex and pyramid flex (aka pocket flex) on a 5-sided hexaflexagon. The upper area with the hexagons represents the states you can get to using the pinch flex. The six rectangles below the hexagons are the states accessible by folding the hexagons in half, leaving the "primary face" on the outside, then opening up pockets and using the pyramid flex. 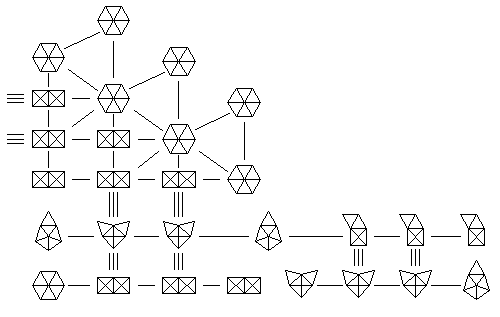 From there you can use the slot flex (represented by triple lines) and pyramid flex to move between the 15 different arrangements at the bottom of the diagram. One state is a hexagon, three involve a pentagon and the remainder are combinations of pyramids and tetrahedrons. The two slot flexes leading off the left edge of the diagram lead to a similar set of 15 states. The above diagram gives a summary of the results. Click on the picture to get a more detailed version showing the numbers and letters on the individual leaves. A hexagon represents the main position of the flexagon. Two side by side rectangles represent a pair of pyramids in various orientations. A pentagon with an attached triangle represents a pentagonal face joined to a tetrahedron. There are two different configurations with a pyramid attached to a pair of tetrahedrons in this diagram. The pictures and labels only focus on one side, typically the inside of shapes that don’t lie flat. 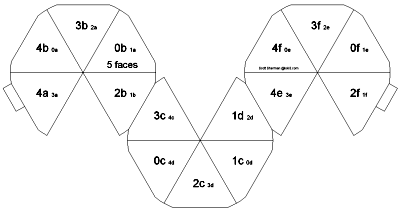 When the inside of a shape consists of the leaves 3c, 3d, 3e and 0a, the 3 will be placed outside the shape, showing it’s the main number. c, d, e and 0a will be listed inside the shape. As you use the slot flex, you’ll note that it requires bending the leaves slightly. However, if you cut off the tips of some of the leaves, many slot flexes can be done without any bending. When it involves a pyramid or pentagon, you have some freedom to pivot the flexagon as you slide part of it through the slot allowing you to avoid bending the leaves. These state diagrams only include slot flexes that don’t require bending if you snip off some corners. Because of the ways these flexes mix everything up, each leaf needs to be individually labeled in order to fully explore the possibilities. You can use the strip below, copying the small numbers to the back and leaving the large numbers on the front. The tips have been trimmed slightly to make the slot flex work more smoothly. 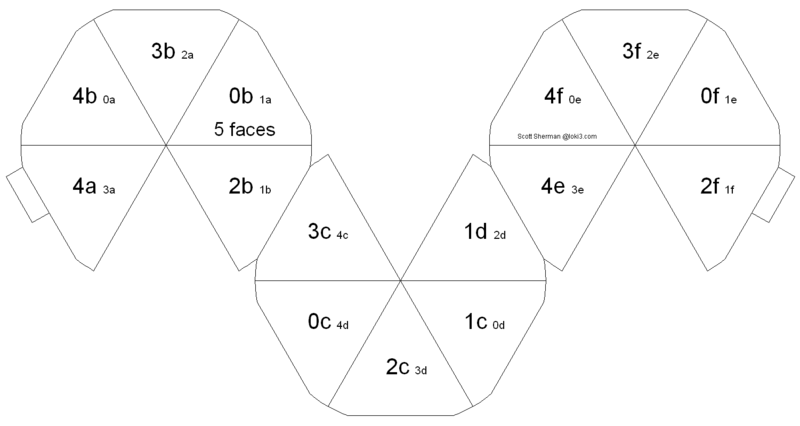 There are 7 main hexagonal states to the 5-sided hexaflexagon using just the pinch flex. From each hexagon, there are three different orientations where you can fold it in half before opening up pockets to see a pair of pyramids. From there, there are six different pyramid pairs you can get to using the pyramid flex. Four of those pairs can be slot flexed. Two lead to one set of 15 configurations and two lead to another set of 15 configurations accessible using the slot flex and pyramid flex. Thus, starting from a hexagon and folding it in half with the 0’s (the primary face) on the outside, there are 3 * (6 + 2 * 15) = 108 different states you can get to by applying symmetry to the above diagram, while tracking the individual leaves. There are additional states you can reach by folding the hexagon in half with something other than the 0’s on the outside, though you don’t get quite as much variety in what’s accessible. With the 5-sided hexaflexagon, these new hexagonal states you find can’t be pinch flexed, but hexaflexagons with more sides may allow this. One example is the 7-sided version found on braids.html.